What is a raster product? Raster products are designed to make adding imagery from sensors to your map simpler. Often these products are provided with multiple individual bands that have to be combined, and it's not always obvious which bands should be combined to a create natural looking image. Sometimes, the data needs to be enhanced before you can understand the features in the image. Sometimes, functions such as Pan-sharpening are added to provide an optimal way to view the imagery. These raster products are designed to help you display and use your imagery quickly and easily in ArcMap. Raster products will appear in the Catalog in place of the metadata files associated with specific vendor products as it's the information in the metadata file that is used to generate them, for example, satellite imagery such as Landsat 7 or QuickBird. Raster products will contain templates for one or more derived raster datasets that you can add to your map. Each will display according to settings within the software. 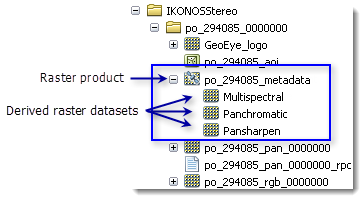 In the example below, the IKONOS Stereo product folder contains several raster datasets, a text file, shapefile, and a raster product, allowing you to display the imagery as either a multispectral, panchromatic, or pan-sharpened raster. Each raster product has a default template. This will typically be Multispectral. If you want to examine the templates used in a raster product, you can examine them by looking at the templates in the same raster type. However, you cannot edit the raster product templates as you can a raster type template. You can use a raster product or one of the derived raster datasets in geoprocessing.